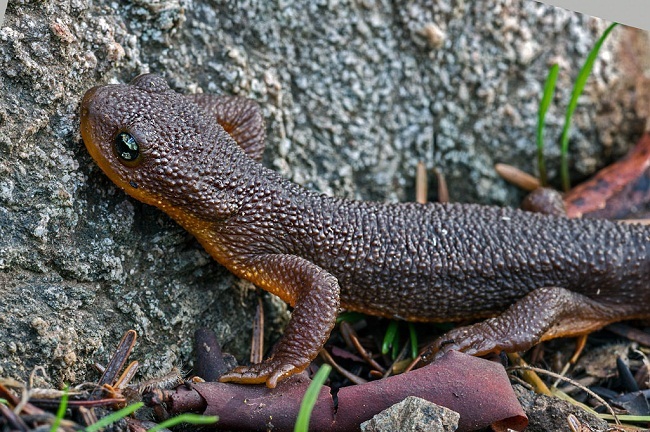 The rough-skinned newt is a small salamander found in North America, well known for its powerful poison. It assumes a defensive posture (unken reflex) when threatened, wherein, it curls its tail and bends its head backward, thus exposing the brightly colored underbelly, driving away the threat. 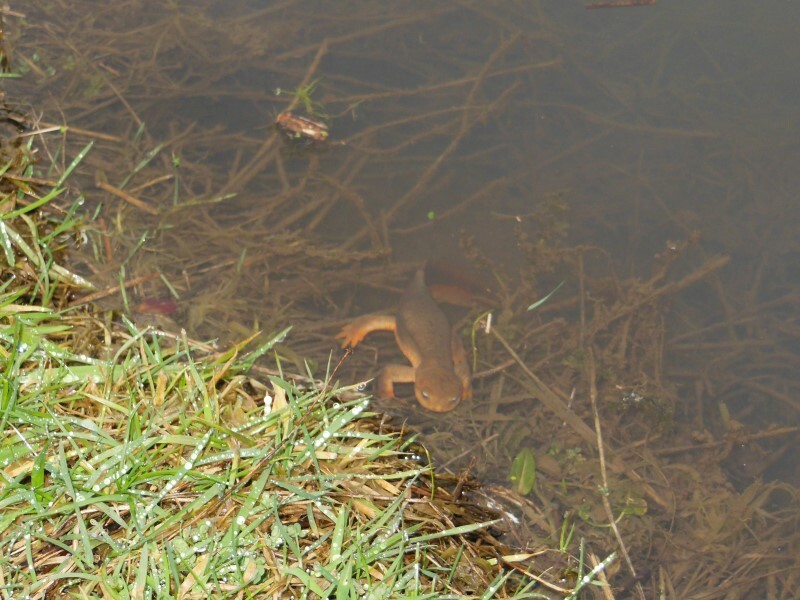 It spends parts of its life, including the breeding season, in water, and otherwise on land. It also migrates to and from its various mating sites. 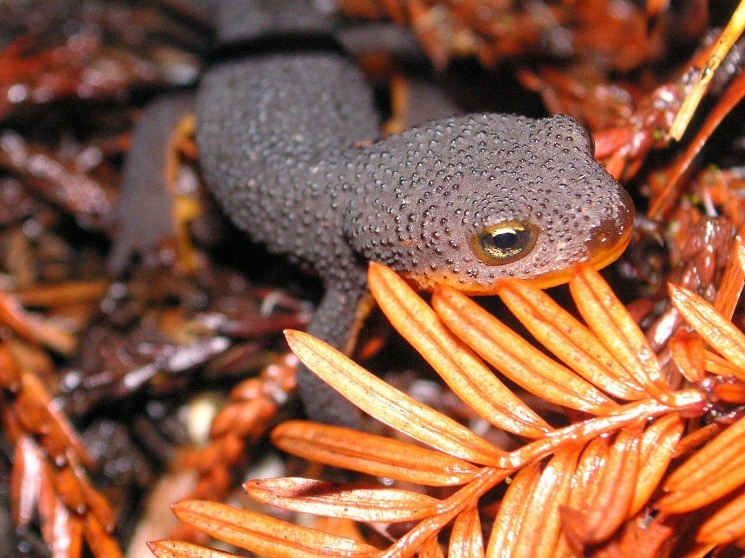 Rough-skinned newts breed in vegetation along the edges of slow or still water bodies. 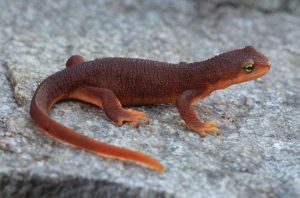 During the breeding season, their cloacal opening swells up and the tails become enlarged and flattened to aid them in swimming. 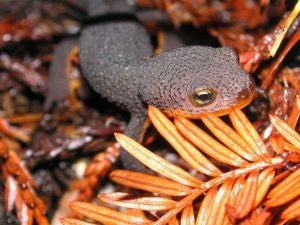 Males reach the breeding territory before females. 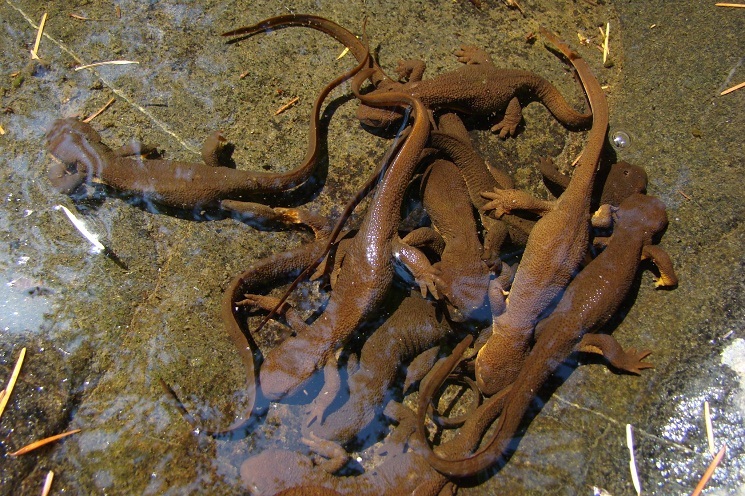 Once a female arrives and gets into the water, often several males grab her and hold on till there is only one left. The victor usually grabs onto the back of the female and swim back and forth in the water, till the female becomes ready to fertilize her eggs. 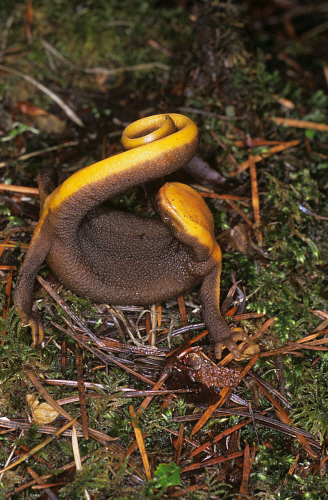 Then the male leaves a spermatophore, which is picked up by the female in her cloacal aperture. 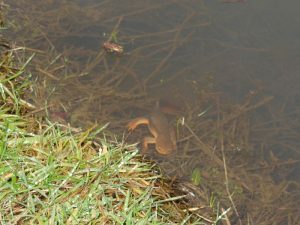 Eggs are laid on stems and leaves of submerged vegetation, a few inches off the water surface. Parental care is non-existent after birth. 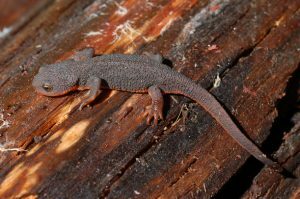 In some locations, the larvae take up to 4-5 months to transform, while in others, the transformation is completed the ensuing summer. 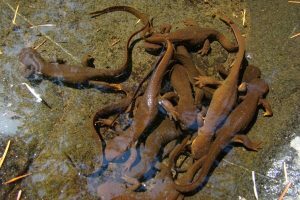 After metamorphosis, the juveniles move onto land. They reach sexual maturity at about 4-5 years of age. 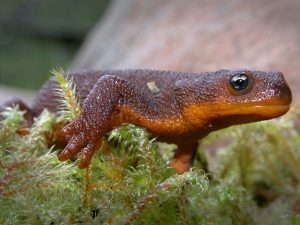 The rough-skinned newt is involved in a co-evolutionary arms race with the common garter snake, which has evolved to tolerate the poison that the newt has to offer, leading the latter to increase the potency of its venom, and so on. If ingested, rough-skinned newt poisoning may be fatal in humans, with symptoms including hypertension, respiratory paralysis, and neurological unresponsiveness, as was the case with an individual from Oregon. 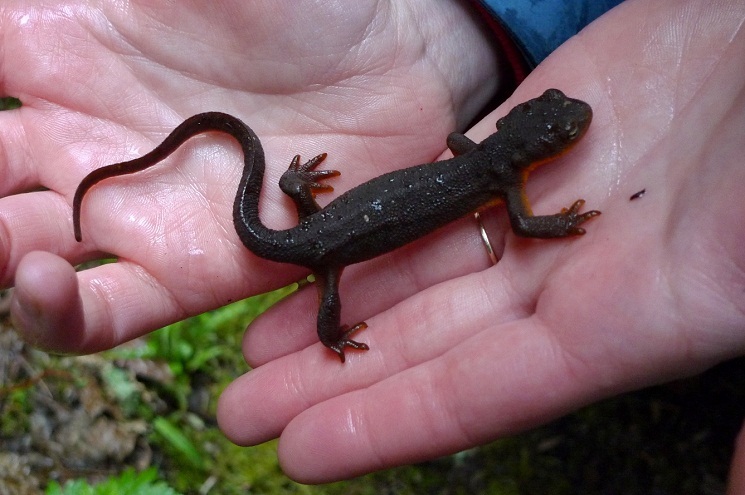 Some people have complained of dermal irritation after touching a newt, especially if the eyes are rubbed. 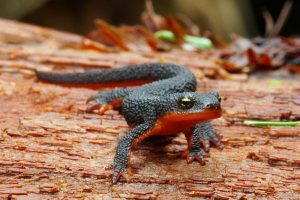 Published on December 30th 2016 by Sudipto Chakrabarti under Coniferous Forest Animals. Article was last reviewed on 14th January 2017.